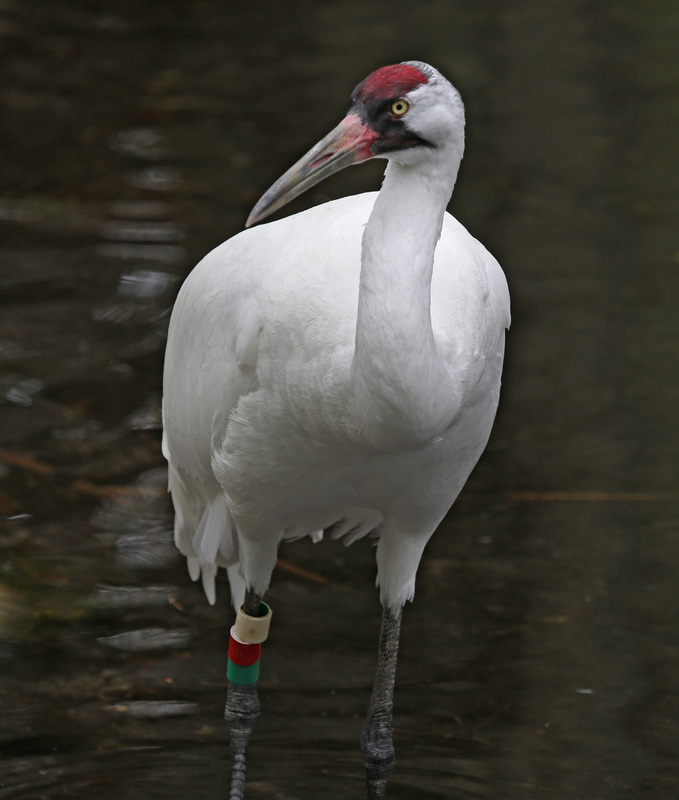 The Whooping Crane is the tallest bird found in North America and is endangered. During the 1940's there were only 21 birds. That number has now grown to almost 600. 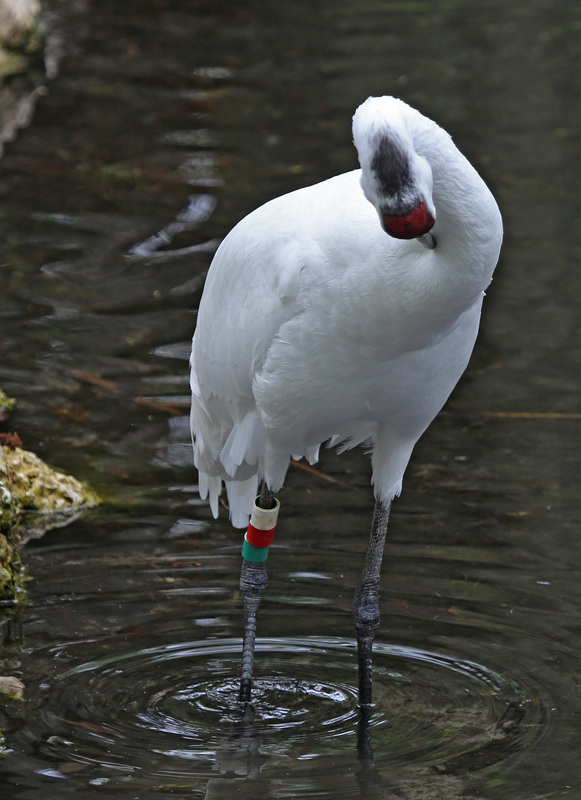 The International Whooping Crane Recovery Team (a joint U.S. and Canada plan) have been working to save this bird from extinction. Whooping Cranes are predominately white with a red crown, red cheek and black wing tips. The bill is long and a dark olive gray transitioning to light red at the base. During breeding season the bill becomes lighter. The legs are dark gray/black and the iris is yellow. Both sexes are similar but the male is slightly larger. Also, the male can be determined by the guard call. Juveniles are mostly reddish cinnamon. 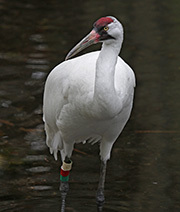 Some estimates put the life span of the Whooping Crane in the wild at a maximum of 30 years but more typically 20-25. 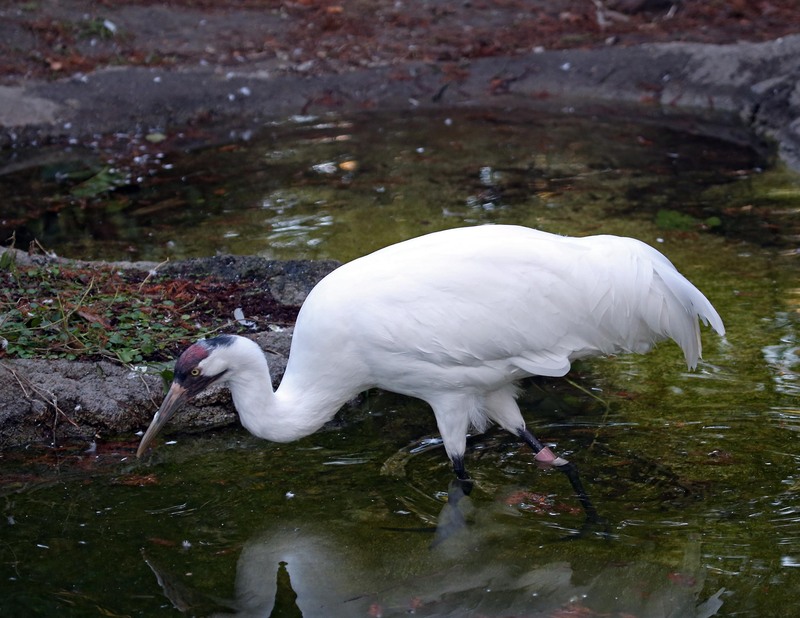 Diet: Whooping Cranes are omnivorous. During the summer they eat insects, small fish, frogs, small birds, rodents and berries. During migration their eat mostly tubers and waste grain. During the winter they primarily eat blue crab, clams, acorns and invertebrates. Courtship: Like other cranes, the Whooping Cranes mated pairs take part in 'unison' calling. While doing this, they usually have their heads thrown back and their beaks pointed skyward. All cranes have a display that involves dancing, bowing, running, jumping and stick tossing. This display is believed to be part of the courtship ritual and may also reinforce the pair bond. Younger birds also 'dance' and the reasons for this may be to help with motor development and to relieve aggression and tension. Nesting: The nest is built of wetland plants in a shallow depression. The eggs are light brown with purplish-brown blotches. Both sexes incubate the eggs. Even though usually two eggs are laid, the hatching or survival rate of the second fledgling is 10%. 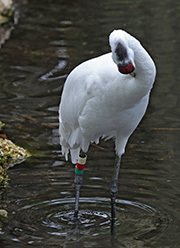 Habitat and Range: Whooping cranes prefer wetlands, marshes, mudflats, wet prairies and fields. Historically, they probably bred throughout the Upper Midwest and northwestern Canada and wintered along the Gulf Coast near Texas. Vocalization: They call with a loud and trumpet-like bugle. During flight, they also call with a deep trill. 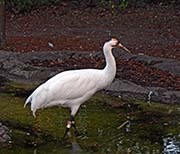 Plumage/Molt: Whooping Cranes do not have an alternate plumage. Migration: The main surviving groups of Whooping Cranes breed in Wood Buffalo National Park in Canada. They migrate to Aransas National Wildlife Refuge in Texas. A group of cranes was introduced to central Florida but they did not know how to migrate. A non-profit organization called 'Operation Migration" has been using ultralight aircraft to train Whooping cranes to migrate. They are trained to follow the aircraft in Wisconsin (breeding grounds) to Florida. The following spring the cranes are able to return on their own. Tongue/feet: Gray-black legs and feet. Back to: Coots, Rails, Cranes, etc.